All artists are tired of persuading their nearest and dearest to look sad look glad look mad madder even madder? Okay hold it. For those artists (and their long-suffering friends) here is the best book ever. 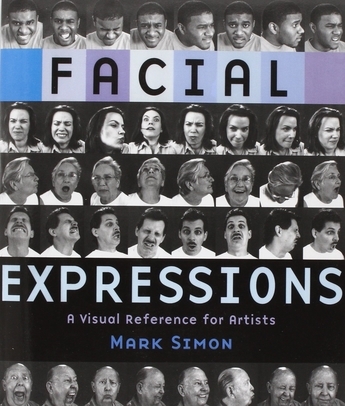 Facial Expressions includes more than 2500 photographs of 50 faces men and women of a variety of ages shapes sizes and ethnicities each demonstrating a wide range of emotions and shown from multiple angles. Who can use this book? Oh only every artist on the planet including art students illustrators fine artists animators storyboarders and comic book artists. But wait there's more! Additional photos focus on people wearing hats and couples kissing while illustrations show skull anatomy and facial musculature. Still not enough? How about a one-of-a-kind series of photos of lips pronouncing the phonemes used in human speech? Animators will swoon and artists will show a range of facial expressions from happy to happiest to ecstatic.